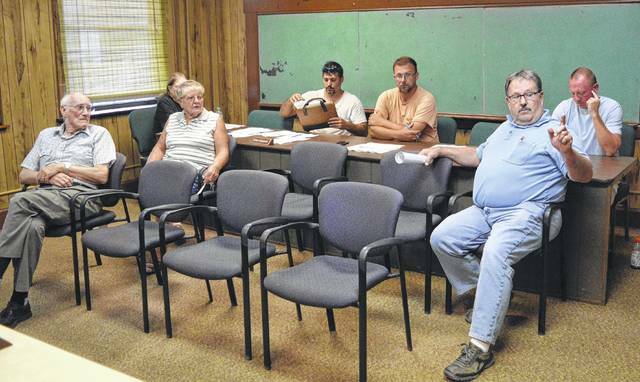 RIO GRANDE — Rio Grande Village Council gathered in the Rio Grande Municipal Building Monday evening to discuss concerns with what the council has called discrepancies in address records between Gallia 911 Communications Center, the Gallia Engineer’s Office and utility company records. Village officials say the differences in recorded addresses comprise a variety of problems ranging from emergency response concerns to package delivery services being late. According to Rio Grande Police Lieutenant Josh Davies and safety volunteer Tim Hemmerick, they believe less than 50 individuals experience the problem in Rio Grande. However, council members have concerns the differences in addresses may be a countywide issue. Hemmerick gestured to a map of Rio Grande with address numbers he said were from the Gallia Engineer’s Office. Davies went onto to explain that Lake Drive had differing numbers if one traveled the street after listing specific names of individuals in the community he knew who lived on the road. The Daily Tribune will not list resident names for the sake of privacy. “Basically, like if you were to call 911, depending on what your phone number is it may show up the address that’s at the engineer’s office or the fixed address that you may have gotten since this,” said Davies. Davies detailed an emergency over the last few months where an ambulance had trouble reaching a residence until aided by law enforcement on duty that knew the exact location of the residence. “We’re talking minutes could mean everything here,” said Rio Grande Mayor Matt Easter. Residents present for the council meeting said they at points had to have discussions with utility companies as their addresses were different given the utility company’s records based on phone call locations. Council members could not pinpoint how address discrepancies happened but felt it may have occurred several years ago when the 911 system was started in Gallia County. Village officials said residents may need to contact utility companies to ascertain correct addresses on record. The Rio Grande Village Council discusses concerns with town address discrepancies and ambulances being able to arrive at correct destinations in the event of an emergency, Tuesday evening.